Jacaranda Trees are not supposed to grow in South Africa. Even though they line many avenues of most cities - particularly in the capital Pretoria - and provide an annual picture of prettiness when they burst into a lilac song each August, they are considered an alien species, dangerous to the many indigenous plants that have to survive in the same soil and thieves of their resources. Similarly, South African seamers are not supposed to have success on Sri Lankan surfaces. Even though they have skills which range from speed and swing to sensational bounce, those are qualities considered foreign in a place where turn and variation flowers. 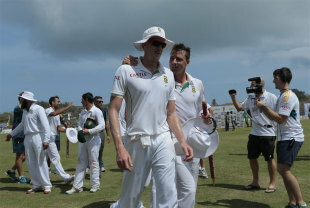 However, Dale Steyn and Morne Morkel shared 16 wickets between them in a display that was as breathtaking as a row of Jacaranda trees in full bloom. The pair's performance was a lesson in commitment to the cause and belief in their own ability, a nod to the new captain Hashim Amla's ability, and a defiant statement against all the elements intended to detail them. Even if you are playing on beach sand, if your attack includes Steyn and Morkel, you would be foolish not to unleash them upfront. Which is exactly what Amla did. The seamers were intense in their early assault and zoned in on Sri Lanka's batsmen, questioning them with the back of a length approach from one end and fuller deliveries on the other. In the eight-over period at the start of the day, they conceded just nine runs along with Vernon Philander, made the batsman play 36 times in 48 deliveries, beat the bat twice, induced the outside edge twice, an inside edge once, removed Kaushal Silva, and had Kumar Sangakkara dropped. They were intense for that half an hour and created an atmosphere of pressure that set the tone for the day. That was broken when Mahela Jayawardene cut Philander behind point off a short ball that was not as menacing as some of the others that had been meted out by Morkel earlier. Amla must have been able to tell it was time to change things up a little bit, and he immediately turned to his spinner to force a tempo shift for the next period. It could have gone awry for South Africa from there. Tahir dished up a mix of deliveries which demonstrated lack of control and consistency and proved ineffective. He finished the match with just a single wicket and was South Africa's most expensive bowler, a statistic which will no doubt raise more questions about his role as the premier spinner in the side. The truth about Tahir is that he wears expectation like a jacket on a warm day: he can't seem to wait to remove it. There should be some understanding for that given the way his career has panned out. There was massive hype surrounding his debut - South Africa had not had an attacking spinner in their Test line-up since Paul Adams - and they were hopeful Tahir would turn it around corners. He believed he could, especially given his showings in the South African domestic circuit. But his enthusiasm would have been deflated with every match that followed. On seamer-friendly surfaces in South Africa, New Zealand, England and then Australia, Tahir had limited chances to make an impact and it all came to a head in Adelaide when he conceded the most runs by any Test bowler in a match. He surrendered his spot to Robin Peterson but took it back in the UAE, where he was selected to play against the country of his birth, Pakistan. Naturally, there would have been some niggle even though Tahir left for love and not the lack of opportunities. Then, Tahir flourished in the conditions and took his first five-for but things have quietened down in subsequent Tests and he only played one against India. Although he has risen to the challenge at limited-overs level, Tahir remains hit and miss in the longer format. That JP Duminy appeared more threatening than him and had a better return than him attests to that. It still does not solve South Africa's spin conundrum because neither of theirs could dominate on a surface which was talked up as being tailor-made for slow bowling. Instead, it was the quicks who bossed proceedings. Morkel bent his back to deliver full balls - something which he has admitted demands a lot out of him - and drew Jayawardene forward to get the edge. Then, he worked to a plan to get rid of Dinesh Chandimal, who had shown a weakness against the short ball. Steyn did the same against Lahiru Thirimanne, whose vulnerability outside the offstump is now an open secret. Both quicks were used in short bursts and brought on when Amla felt he could make a breakthrough. Every time Amla called on Steyn, he demonstrated the same determination that makes him one of the world's best. He did not let up, in pace or aggression, and he attacked the stumps. When Tahir was struggling on one end, Philander was used at the other to ensure Sri Lanka did not get a chance to relax. Amla was thinking all the time, he admitted it left him feeling "mentally drained," in some parts but it paid off. When South Africa started the day, they needed nine wickets and they surmised it might take them most of the 90 overs to get that going by history. In the end, they needed less than half that time because of a combination of their own ruthlessness and Sri Lanka's soft middle order. That is a testament to a good strategy which is as attractive to purists as a pathway lined with flowering trees is to photographers. South Africans love Jacaranda trees because they so often provide that picture. Cricket watchers would have felt the same about the visitors' bowling performance.